Located just minutes from LAX, the H Hotel Los Angeles, Curio Collection by Hilton is your connection to LA’s eclectic neighborhoods, attractions, movie studios and more. We’re also just a short drive from the South Bay and fascinating nearby cities like Beverly Hills, Culver City, Venice Beach, and Marina del Rey. Along with one of the most beautiful beaches near LA, Manhattan Beach is a fun and vibrant city ideal for those seeking a quintessential SoCal beach town. Walk or bike along “The Strand”, check out the surfers at the beach or explore the famous Manhattan Beach Pier, which was built around 1920. 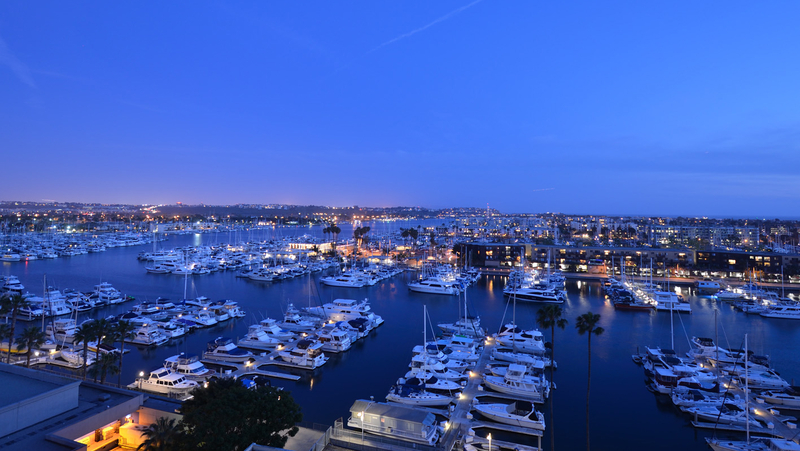 Located along the Westside of LA, Marina del Rey is a tranquil, waterfront community known for its luxury yachts, great fishing, and seaside restaurants. If you prefer to stay on dry land, Marina del Rey also boasts a scenic 22-mile coastal bike path, free guided birdwatching tours at Burton Chace Park, luxurious spas, and ample shopping. Known for attracting LA’s creative and artistic set, Venice Beach was once the epicenter of the Beat Generation of poets. Today, that legacy of art and progressive social change can still be felt on the city’s famous promenade, where visitors can experience the city’s vibrant street performers and local artists as well as excellent shopping and dining destinations. Home to the world-famous Muscle Beach, the city’s natural beauty and nearly perfect weather has also made it popular choice for outdoor activities like beach volleyball, skating, and basketball. Chances are some of your favorite movies and TV shows were filmed in this famous city, including golden-era classics like The Wizard of Oz and Gone with the Wind as well as modern shows like Jeopardy!, Hell’s Kitchen, and Arrested Development. Go behind the scenes with a guided tour at Sony Pictures Studio, indulge in a little retail therapy at the high-end Platform complex or explore some of the city’s unique landmarks like the Helms Bakery, Kirk Douglas Theater, and the Wende Museum. Famous for its designer shopping, dazzling mansions, and iconic restaurants, Beverly Hills is a glamourous playground for LA’s elite. Stroll down famous Rodeo Drive and pick up a few items from celebrated design houses like Louis Vuitton, Prada, Valentino, and Brooks Brothers. Go celebrity spotting at hot spots like Spago and The Ivy, or tour iconic film locations like Greystone Mansion. Just remember to bring your credit card. Featuring 3.5 miles of pristine coastline and a laid-back atmosphere, Santa Monica offers a refreshing escape from the hustle and bustle of downtown LA. Along with picture-perfect days on the beach, the city’s eclectic mix of gourmet restaurants, vibrant boutiques, and art galleries offers something for everyone. Thrill seekers can even get a few rollercoaster rides in at Pacific Park. Of course, no visit is complete without visiting the iconic Santa Monica pier or checking out the shops along the pedestrian-only 3rd Street Promenade.